Application Closing Date : 20.06.2018. Engineers India Limited, a Navratna PSU and an Engineering Consultancy Company is looking for dynamic professionals with a passion for excellence and the drive to partner in the Nation’s Growth story. Recruitment Of Experienced Professional only. The Company has embarked on an expansion plan into sunrise sectors such as Nuclear, Solar, Water & Waste Management and is increasing its international presence in over 13 countries world-wide. Relevant Post Qualification Experience in Construction related activities in Hydrocarbon/Fertilizers / Infrastructure/Pipelines/Metallurgical Plants/Power Plants/Nuclear plants etc. 32 BE/ B. Tech/ B.Sc. (Engg.) in Instrumentation discipline with minimum 65% marks or eqv. CGPA/ CPI. Power Plants/ Nuclear plant etc. 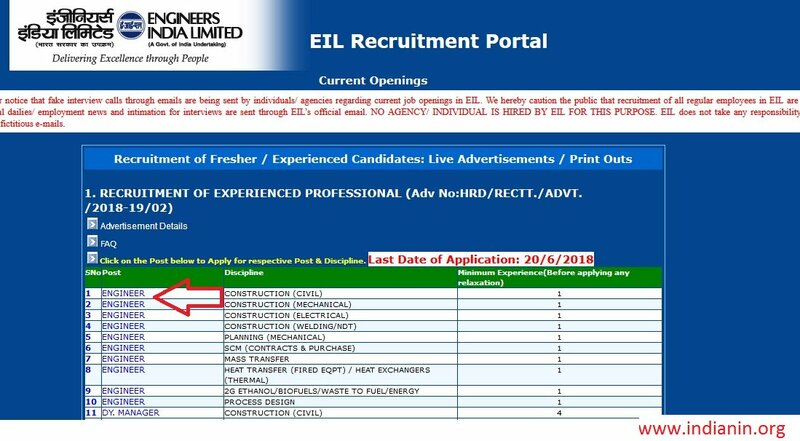 ** The cut-off date for educational qualification, required experience (if applicable) and upper age is 30.05.2018. CTC shall include Basic Pay, DA, HRA, Other Perks & Allowances, encashment of earned leaves and Retirement benefits as applicable. Next Screen will be opened, click on “particular post” to apply online. Step 4 : Select [yes/No]Are you an EIL Employee ? Step 1 : Select Yes/ No Were you interviewed during the last year for the same level/post ? Step 2 : Select yes/No Have you passed the minimum qualifying examination as applicable, in the minimum period required ? Step 3 : Select Yes/No Are you an ex – serviceman? Step 4 : Browse and Upload all your relevant Qualifying Degrees certificate alongwith mark sheets and experience certificates.Again follow the step 2. Step 5 : Browse and Upload your category certificate Again follow the step 2. Step 6 : Click the ‘Upload’ button. then Click “Save ” Button. Step 7 : Click on “Finish” button, then take print out and retain a copy of online application form(s) for future reference. 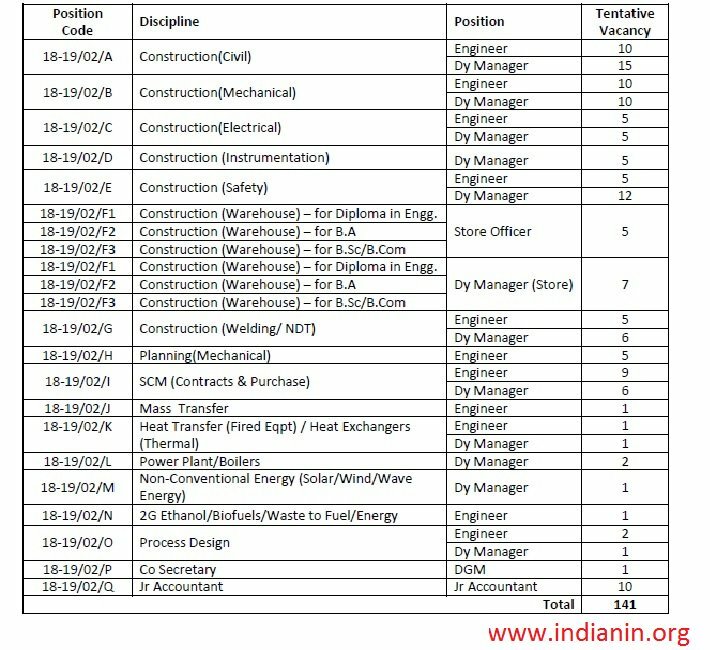 The place of posting for Construction Engineers/Officers in all levels shall be at construction sites/offices and for others may be at Head Office New Delhi / Gurugram, Regional Offices at Chennai, Vadodara, Kolkata, Branch Office at Mumbai,Inspection Offices and Construction Sites etc. 1. The mode of selection for all the positions (except for Jr Accountant) will be through Interview preferably at Delhi. 2. For Jr Accountant position, the mode of Selection shall be Written Test(s). ** Candidates should take print out and retain a copy of online application form(s) for future reference. ** Copy of the online application is not to be sent by post.